New! JouleConnect – management software for sites with multiple JouleAlarm and JouleTemp. Temperature & Humidity control, monitoring and Alarm, Web browser interface, integrated data logging, Modbus, JouleTemp lays claim to being the most powerful Cool Room/Environmental control available today. Temperature control includes 2 cooling +2 Heat output stages. No software to install, uses web browser over LAN and the internet, or use JouleConnect software if preferred Real time Clock and alarm buzzer included. Precision temperature control with cooling and heating mode. Comprehensive defrost control, up to 12 per day at nominated times. Self Test function, checks installation. Based on our most successful TACm, shares similar programming and enclosure. Sensor (included) with 6m lead can be extended to 100m. Unique Straight or Tilt mounting enclosure. 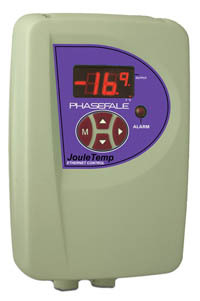 The Jouletemp is an amazingly powerful yet compact unit ideally suited to controlling cool rooms and freezer rooms although it has now found applications in many different area’s such as computer rooms, Elevator Motor Lift Rooms, fish breeding, Wine Room, Archival storage, mortuary, pathology friges, holding tanks and various other process control and monitoring situations. With all the features of TACm , plus new and powerful logging, ethernet and humidity functions, JouleTemp is the control of choice of refrigeration consultants around Australia. New! Kinetic Servo Drives in action!